All unilateral sanctions by one country against others are flagrantly illegal. Under international law, Security Council members alone may impose them. 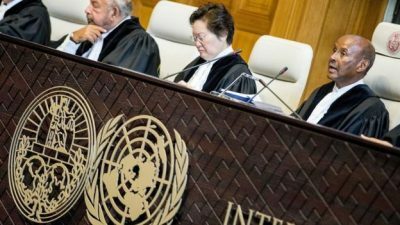 The International Court of Justice (ICJ-World Court) preliminary ruling against the US is positive. It didn’t go far enough because on July 16, 2018, the Islamic Republic petitioned the ICJ for sanctions relief, claiming the Trump regime violated terms of their 1955 US-Iran Treaty of Amity, Economic Relations, and Consular Rights. The Court concluded that there is “little prospect of improvement,” based on harsh US behavior toward Iran. The ICJ’s ruling is positive for all countries abused by unjust and unilaterally imposed sanctions against them. Washington weaponized them to wage political and economic war on targeted nations – notably Iran, Syria, Russia, North Korea and Venezuela. Sanctions imposed for these reasons lack legitimacy. Unilaterally imposed ones are flagrantly illegal. Though the Court’s ruling is binding, Washington notoriously flouts what conflicts with its interests. The Trump regime is highly unlikely to change its hostile agenda toward Iran. It’s most unlikely to abide by the Court’s ruling. What’s most important is how the world community reacts. Rejecting unilaterally imposed US sanctions against Iran would be a major triumph for the Islamic Republic – especially ones imposed by the Trump regime and GOP-dominated Congress under the so-called Countering America’s Adversaries Through Sanctions Act (CAATSA). It directs Trump to impose sanctions on Iran’s legitimate ballistic missile program – intended solely for defense. It falsely accuses Iran of having or developing weapons of mass destruction – meaning nukes it doesn’t have, deplores, and wants eliminated everywhere. It prohibits the sale or transfer of military and related equipment to Iran, as well as technical and financial aid. On August 6, the Trump regime reimposed nuclear-related sanctions on Iran. Stiffer JCPOA-related sanctions will be reimposed on November 4 – targeting Tehran’s energy sector, petroleum related products, and central bank transactions. Its policy is all about isolating Iran politically and economically, notably attempting to block its oil sales, access to hard currencies and foreign investments, along with harsh sanctions and overall financial hardships – part of a regime change plot. The strategy is unlikely to work. The ICJ ruling makes it tougher, giving credence to Iran’s claims about illegal US actions against the country. The Trump regime no doubt will ignore the ruling, further isolating itself. It’s up to the world community to use the ICJ ruling to break from its hostile agenda against the Islamic Republic, rendering it useless.